Rain, rain go (and stay) away! The United Kingdom has a soggy start to 2014. After weeks of rain, the lingering English grey sky makes even the most upbeat of us feel gloomy and depressed. I realised yesterday how desperately the country needs a good wringing out when a flock of seagulls sought refuge in our countryside woodland. Squawk! Inevitably, bad weather has poor timing, and this winter front is no exception. Christmas school holidays and seasonal closures have found me reaching deep into my creative hat for fun indoor activities for our toddler. 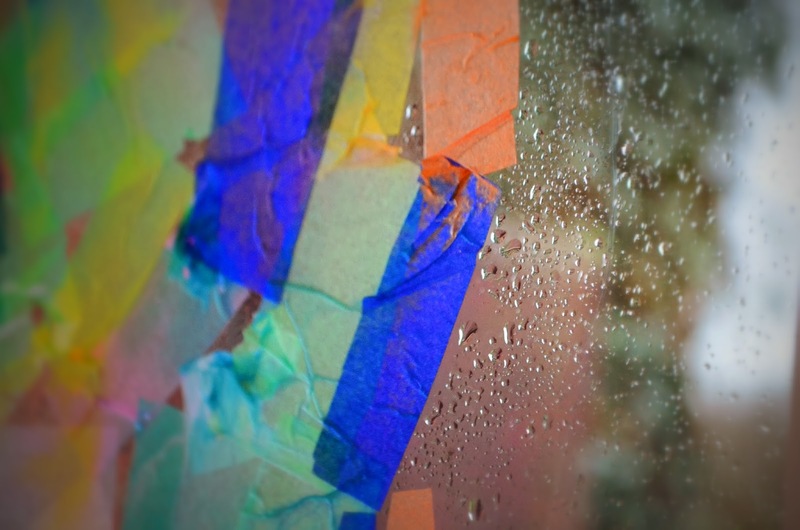 Perhaps the reason I love this sensory play for a rainy day is because of its invigorating and cheerful colours. 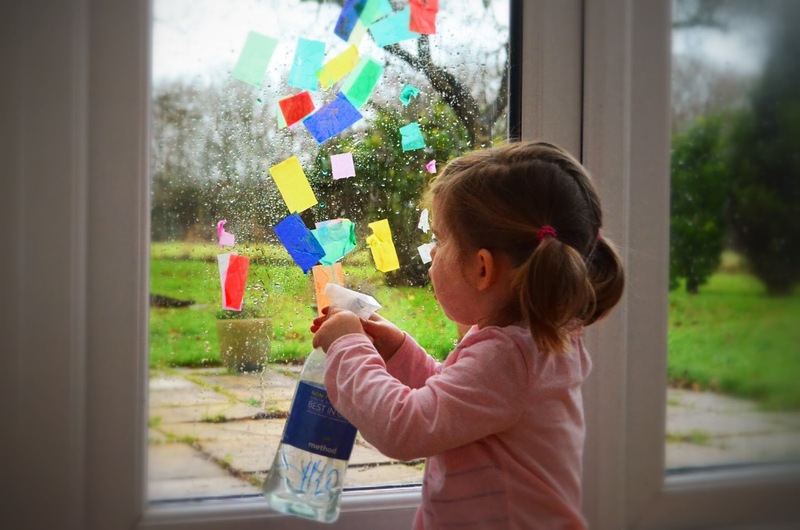 It involves three things that most have at their fingertips: coloured tissue paper, a spray bottle, and a window. The cleanup is minimal and it is a great exercise for the child to practice fine motor skills and color mixing. 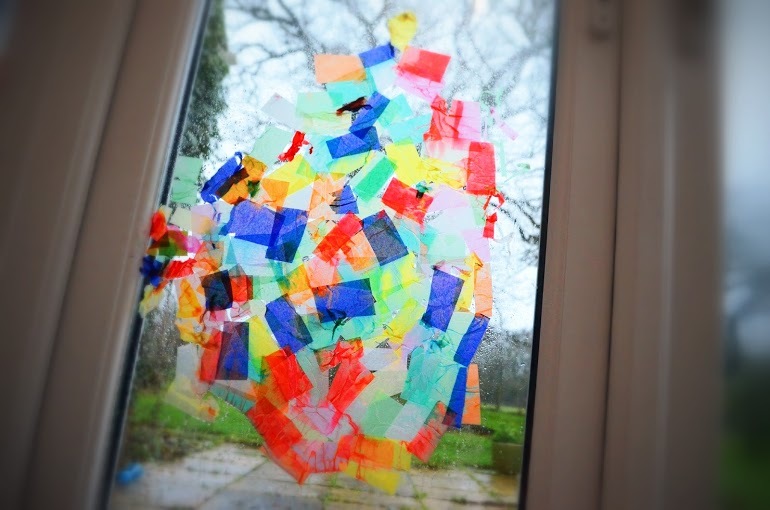 And best of all, the end result is a multi-coloured window that is sure to brighten up a dreary day. 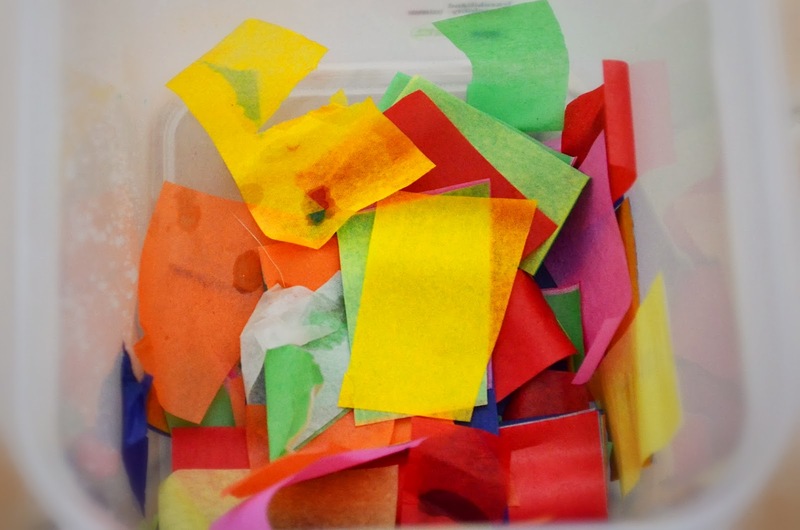 Cut the tissue paper into small squares (or whichever shapes you fancy) and place into a container. 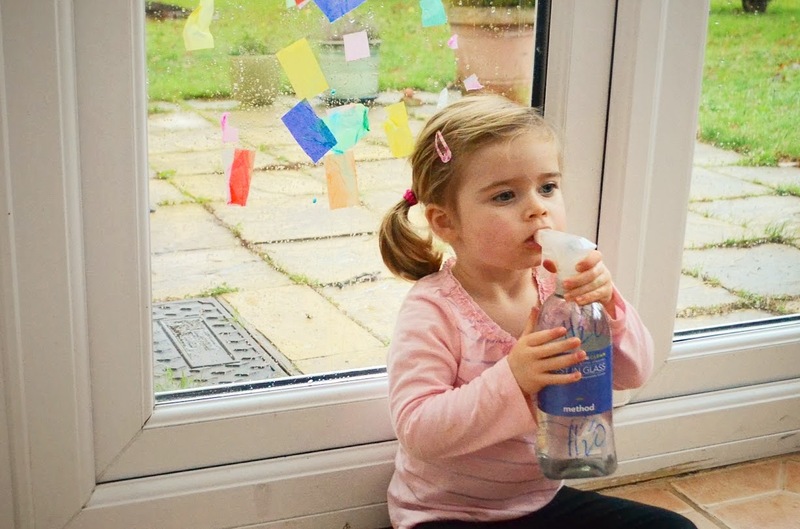 Ensure the child is able to easily spray the water from the bottle. I only filled a quarter of the bottle so as not too heavy for the toddler to hold (and less of a water spill should the cap be unscrewed by my clever artist). Ouisie really enjoyed spraying the water. At first, she carefully pieced the cut tissue paper one at a time and ensured each was secure with her “glue” water. 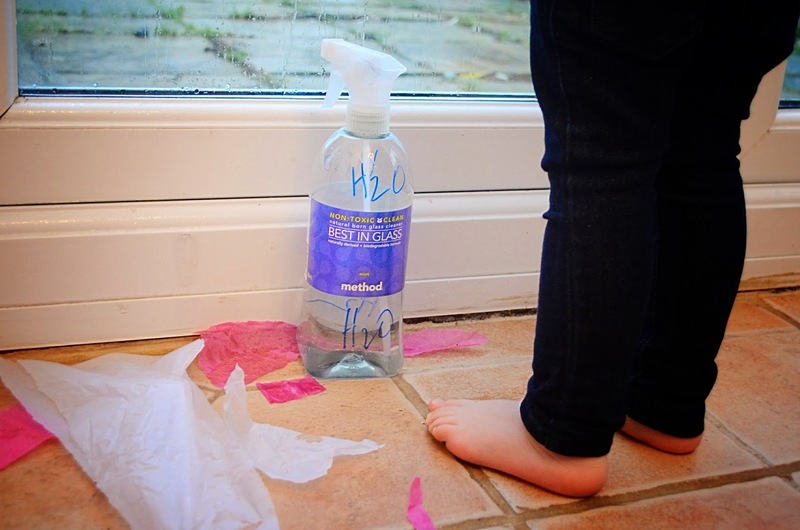 Note: The dye from the tissue paper will run down the window if a lot of water is applied. If worried about any stains, best to protect floor, baseboard, and window frame before activity. 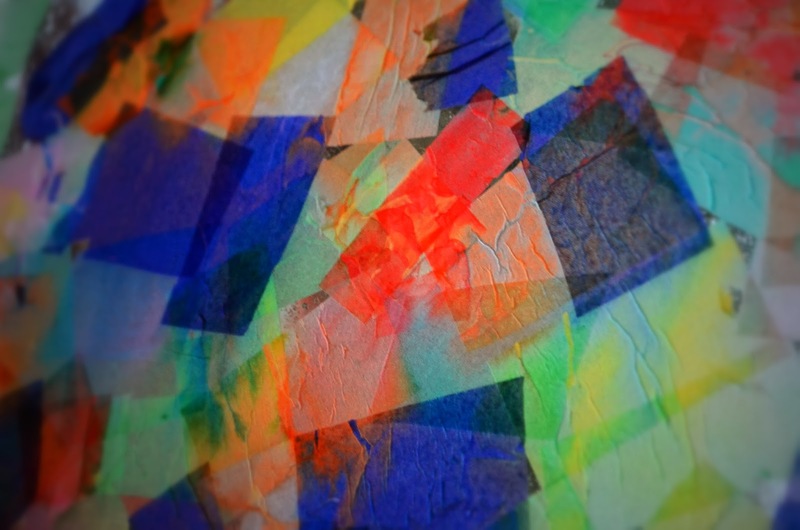 Almost immediately, the first pieces of tissue paper brought lovely bright colour into the room. It was the next best thing to natural sunshine! The fascination with the sticking the tissue paper was temporarily lost to spraying water into her mouth. Ouisie then began to apply multiple pieces of tissue paper at a time. We watched as the water from the spray bottle bled the colours together forming new pigments. The activity held Ouisie’s attention for a good 45-minutes which is a light year for a toddler! The tissue paper stayed on the window even after drying. 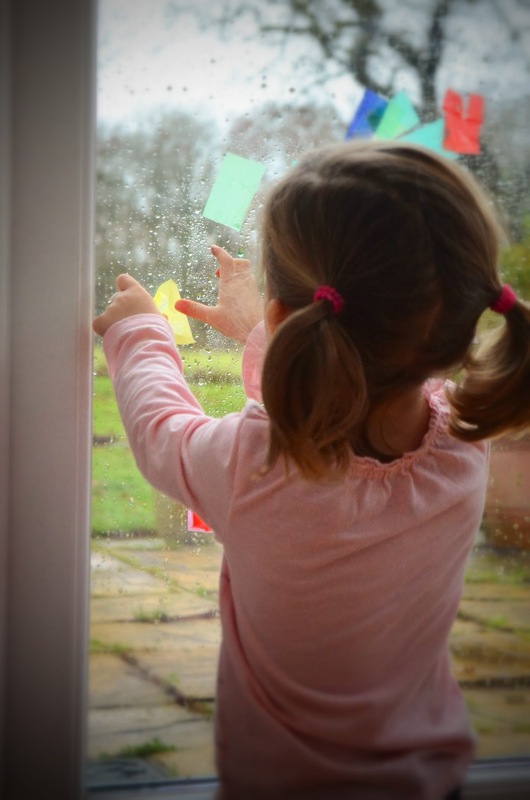 If you allow the paper to dry onto the window, please note it takes a little more work to clean up as some of the paper may need to be lightly scratched off. Et voila! Notre Dame de Hampshire. How pretty does that rose window look against the backdrop of rain? Here is proof that every dark cloud has a silver (or multi coloured) lining! I LOVE it. What a “brilliant” activity for a preschooler on a cold, rainy day. Mom must have loved the easy clean up afterwards too. I'm sure the bright “stained glass” window helped lift everyone's spirits under the gray English skies.